More information just in on the auction of the veil. There were just two telephone bidders, but once the hammer went down a representative from the Alençon Museum of Fine Arts and Lace in the room stood up and announced that they were buying the piece. This was due to the French law of pre-emption – once a price has been decided at auction a state museum has the right to step in and buy at that price. 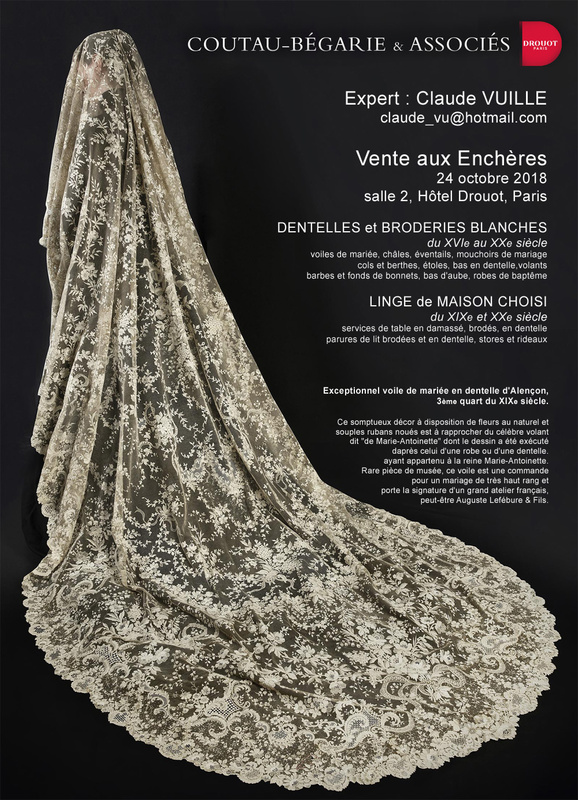 Potential lace buyers – Learn this lesson well, and remember it the next time you bid on a spectacular piece of lace at Drouot. This auction is astonishing, perhaps the best in about 30 years (Congratulations, Claude!). This first part is about linens, with some excellent lace pieces (lots 61, 62, 63, 65, 65 for example). Lot 140 Sedan collar – I don’t recognize the form, it was probably remade from another piece. Lot 146 Lappets in 2nd quarter 18th c Belgian needlelace. Someday I’ll do a piece on the term ‘point de venise a reseau’, which is basically a meaningless name. Lot 215 Veil of Brussels bobbinlace applique on droschel ground. Lot 218 Catalonian blonde black silk mantilla – a wonderful lace, often overlooked. Lot 239 Wedding veil of Brussels needlelace applique on machine net. Lot 242 The Alençon wedding veil, 3rd quarter 19th c. It doesn’t have a specific provenance, and could be a Lefebure piece, although there were several other firms capabile of doing work of this quality. Lot 256 A Valenciennes de Gand collar, copy of the one in the Minneapolis Institute of Art. (I cataloged that piece around 1980, so this one means a lot to me). See also lot 338. Lot 279 – Bayeux ombré fan leaf. Lot 354 – Unusual, extravagent Alençon flounce. See also Lots 358 and 359. Lot 363 – Burano flounce, interesting design. Lot 371 – Point ground flounce, might also be Bucks. For those not in the USA, the Mega Millions lottery will be up to $1.6 billion with the next drawing on Tuesday, October 23rd. If you win, buy every single piece in this entire auction. If you want to bid by yourself you will have to create an account. Then you will be able to follow the sale with a real time viewing of the auction directly from your computer. You can bid by clicking the appropriate bidding price when the auctioneer reaches the lot you are interested in. If you wish to register for the auction please follow the instructions at http://tinyurl.com/zl5beow to create a Drouot Live Account. You must also register for this specific auction before 9:00 AM, October 24th – go to http://tinyurl.com/ycsx9fwn. The view on your computer has a few seconds delay but the auctioneer is used to it and he will wait a few second when somebody is bidding through the net. This works well as long as the internet equipment has no connection troubles. Buyer fee’s is 27.60% TTC (23% plus TVA of 20%). Apologies, I misread the catalog on some items. Certain pieces are not from the publications of Ricci, Levey, Simeon, and Toomer. They are however, similar to examples illustrated in these works. I’ve corrected the post.